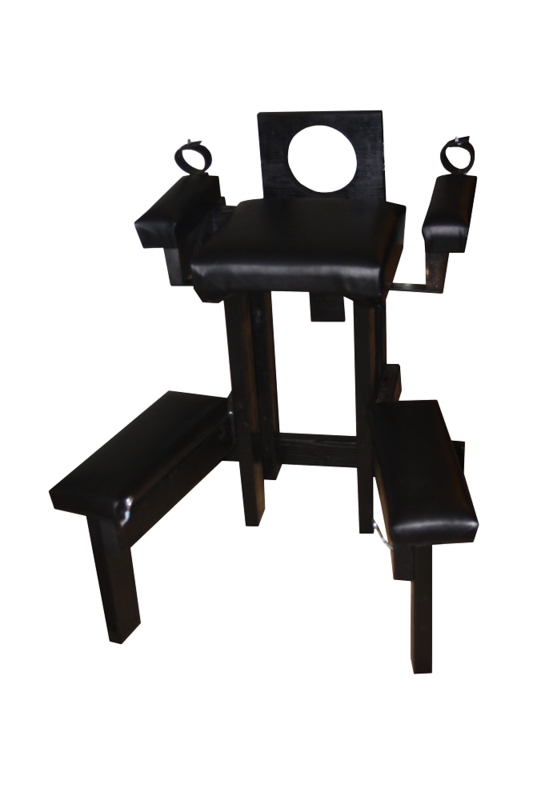 The stockade bench with time release handcuffs is built with the large size spankees in mind. It will hold up to 300 lbs. The main frame of the bench is made of 2 x 4. All parts are either screwed, or bolted together. There are no nails used in the assembly. The chest rest portion is 16" wide x 17" long. It is covered with 2" thick foam, topped off with very durable black vinyl. The stockade is made of a 2 x 12. 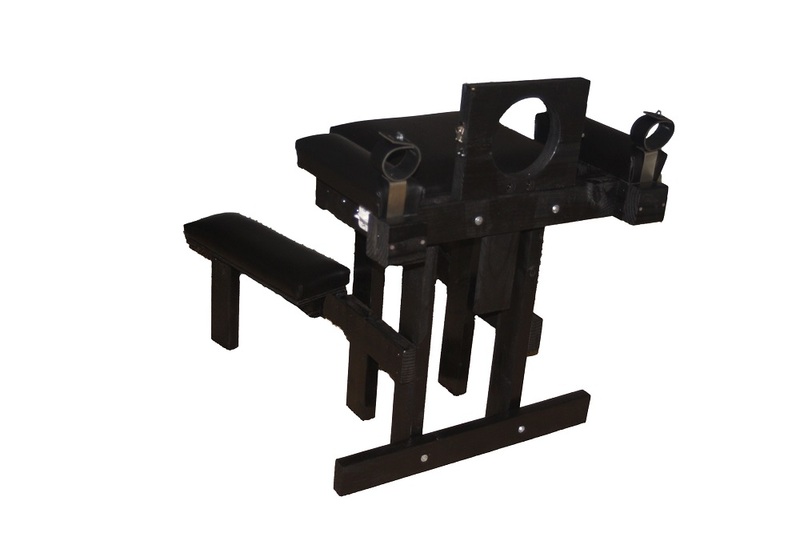 The hole in the center of the stockade is designed to fit up to a 20" neck. It is hand sanded for a smooth, and comfortable fit. Hinges on one side allows it to be opened and closed. A draw latch on the other side allows it to be locked with a padlock. The arm rest are made of 2x4s. They are 14" long. They too are covered with 2" thick foam, topped off with black vinyl. The time release handcuffs are made of synthetic leather. They are the buckle design that are adjustable to fit all wrist sizes. There is a thin metal strap attached to the handcuffs. This strap is inserted into a slot in the arm rest. A timer is built into the arm rest. The timer has a rod attached to it. When the timer is set, the rod is pushed into the hole at the bottom of the metal strap which is attached to the handcuffs. This secures the handcuffs to the bench. As time passes, the rod is slowly pulled back until it is no longer through the hole in the metal plate which is attached to the cuffs. Thus the cuffs are released. You can now use your hands to unlock the neck stockade. The knee rest are made of 1/2" thick ply wood, 6" wide, and 19" long. They too are covered with 2" thick foam, and topped off with black vinyl. 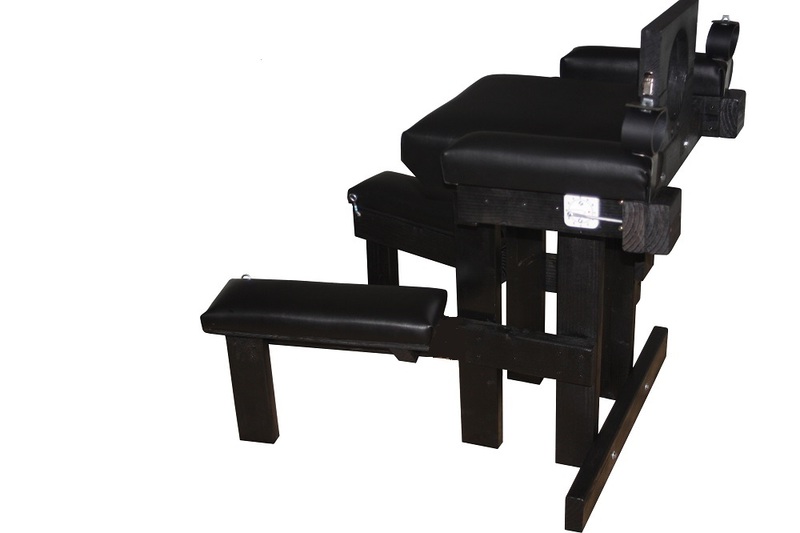 The knees are designed to be mounted parallel to the bench, or at an angle, which spreads the legs apart. There is plenty of room between the legs that will allow a person to stand behind the spankee, between their legs.